Elections 2018 Exit Poll for Rajasthan, MP, Chhattisgarh, Mizoram, Telangana: An aggregate of three exit polls reveals that Chhattisgarh CM Raman Singh is likely to return to power with BJP expected to win 46 out of 90 seats. The election results will be declared on December 11. Rajasthan, MP, Chhattisgarh, Mizoram, Telangana Election Exit Poll 2018 LIVE Updates: BJP and Congress are headed for a photo finish contest in the battle for Madhya Pradesh, according to India Today-Axis My India exit poll. While the Congress is projected to win 104-122 seats, the BJP is likely to secure 102-120 seats. However, the results released by Times Now-CNX projected a clear victory for the BJP with 126 seats and 89 seats for the Congress. In Rajasthan, an aggregate of the exit poll results predicted a comfortable victory for the Congress over the BJP. While exit polls predicted a tight race between Congress and BJP in 90-seat Chhattisgarh assembly, they projected that K Chandrashekhar Rao-led TRS is set to retain power in the 119-seat Telangana assembly. The Congress, on the other hand, may lose Mizoram to the opposition Mizo National Front (MNF), exit polls showed. The election results will be declared on December 11. The India Today-Axis My India has predicted that the MNF in Mizoram will manage to reach the half-way mark by attaining 16-22 seats. The Congress, that ruled the state for the previous two terms, may secure 8-12 seats, the exit poll said. MNF is likely to secure a vote share of 34 per cent and Congress of 29 per cent. There are 40 seats in the state assembly. According to Times Now-CNX, the opposition MNF will attain 18 seats while the Congress will win 16 seats. The exit polls conducted by Republic-C-Voter showed the MNF getting 16-20 seats. The exit polls were announced after polling ended in Rajasthan and Telangana today. In Madhya Pradesh and Mizoram, polling was held on November 28. In Chhattisgarh, it was held in two phases on November 12 and 20. The results of all the five states will be declared on December 11. 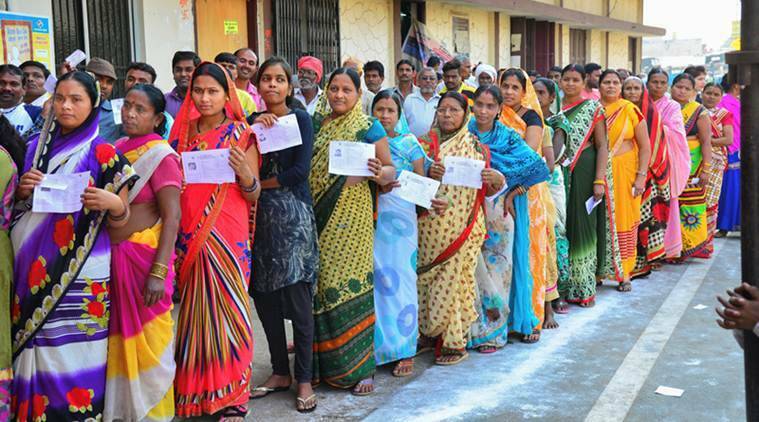 A voter turnout of 67 per cent was registered in Telangana and 72.62 per cent in Rajasthan today where elections were held earlier in the day, the Election Commission announced. Unlike India Today-Axis My India and Times Now-CNX which have predicted a comfortable win for the Congress, Republic-C-Voter has predicted a close fight with the BJP. It has predicted 81-101 seats for the Congress and 83-103 seats for the BJP. News Nation, however, predicted 99-103 seats for the Congress and 89-93 seats for the BJP. KCR-led TRS to retain power in #Telangana, exit polls predict. Telangana assembly has 119 seats with 60 being the majority mark. In Mizoram, the exit polls conducted by Republic-C-Voter shows the main opposition Mizo National Front (MNF), headed by Zoramthanga, getting 16-20 seats. It has predicted 14-18 seats for the Congress while 3-10 seats for remaining parties. There are 40 seats in the Mizoram Assembly. In Telangana, Republic TV-Jan Ki Baat-C Voters have predicted 50-65 seats for the present TRS government. It has predicted 38-52 seats for Telangana Desam Party (TDP) and 4-7 seats for the BJP. It has predicted 8-14 seats for others. India Today-Axis My India also gave the larger share of the pie to the TRS with 79-91 seats. Its has predicted 21-33 seats for TDP and 1-3 seats for the BJP. In Telangana, Times Now-CNX has predicted 66 seats for TRS, 37 seats for Congress while only seven seats for BJP. The Telangana assembly has 119 seats in total. Shifting focus to Rajasthan, India Today-Axis My India Exit Poll has predicted a win for the Congress with 119-141 seats. The BJP, it has predicted, will win only 55-72 seats. Times Now-CNX has also predicted 105 seats for Congress and 85 seats for BJP. India Today-Axis My India Exit Poll has predicted a victory for the Congress in Chhattisgarh with 119-141 seats while it has projected 55-72 seats for the BJP. Results released by Republic C-Voter has predicted 35-43 seats for the BJP while 40-50 seats for the Congress in Chhattisgarh. News Nation, on the other hand, has given 38-42 seats for the BJP and 40-44 seats for the Congress. The BJP will win 42-50 seats while the Congress will win 32-38, India TV reported. An aggregate of three exit polls reveals that Chhattisgarh CM Raman Singh is likely to return to power with BJP expected to win 46 out of 90 seats. The Congress is expected to win 35 seats, while the Ajit Jogi-Mayawati alliance could win 7 seats, the polls say. NewsX-ITV Network has predicted 112 seats for Congress while 106 seats for BJP in Madhya Pradesh. Exit poll results released by ABP predict 21 seats for Congress and 10 seats for BJP in Chambal district. However, the results released by Times Now-CNX projects a clear victory for the BJP with 126 seats and 89 seats for the Congress. According to India Today-Axis My India Exit Poll, the Congress is set to win 104-122 seats while the BJP is set to win 102-120 seats. The projected vote share for the BJP is 40 per cent while for Congress, it is 41 per cent. While there are 200 seats in Rajasthan, voting in Ramgarh constituency has been postponed following the death of Bahujan Samaj Party (BSP) Laxman Singh. Singh had died due to cardiac arrest last week. "BSP candidate Laxman Singh died on Thursday morning. Elections are postponed on death of any candidate and next date of election on the seat will be notified by the Election Commission of India," Pankaj Kumar, returning officer of Ramgarh, had told news agency PTI. Where and how to watch exit polls? Various news channels, along with other agencies, are expected to release the exit poll results. Some of the channels and agencies are – News24, Chanakya exit poll, India Today exit poll and C-group exit poll. For more information, click here. The key candidates in the five assemblies include stalwarts like MP Chief Minister Shivraj Singh Chouhan. who is once again contesting from his home turf of Budhni and is looking forward to maintaining his hold. In Rajasthan, the key candidates are Vasundhara Raje and Congress’ Sachin Pilot who is contesting from Tonk and is hopeful of entering the Vidhan Sabha. In Chhattisgarh, while Ajit Jogi will be an important factor, incumbent Chief Minister Raman Singh is hopeful of returning to the assembly. Meanwhile, in Telangana, Chief Minister K Chandrashekhar Rao who had dissolved the assembly to hold an early election is hoping for another stint by winning from Gajwel constituency which he had won in the last elections and helped in carving the state out of Andhra Pradesh. How many seats in each assembly went to polls? In Rajasthan, polling was held on 199 Vidhan Sabha constituencies while in Madhya Pradesh, elections were contested on 230 seats. The Telangana assembly has 119 seats while Chhattisgarh has 90 seats followed by 40-member assembly of Mizoram. Who are the key parties in five assemblies? While BJP and Congress have emerged as the two main opponents, regional parties also seem to be having a sway in the states of Telangana and Chhattisgarh. In Chhattisgarh, BSP has joined hands with Ajit Jogi-led Janta Congress Chhattisgarh and will be looking to create a dent in the vote-base of both the traditional parties in the state. Meanwhile, in Telangana, the incumbent TRS under K Chandrashekhar Rao will be looking to coming back to power. In Madhya Pradesh, the BJP will be looking to continue in power after running the government for three successive terms under chief minister Shivraj Singh Chouhan, while in Mizoram the fight is between the MNF and the BJP. While voting in Rajasthan and Telangana were held today, in Madhya Pradesh and Mizoram, it was held on November 28. Polling in Chhattisgarh was held in two phases on November 12 and 20. The results of all the five states will be declared on December 11. With polling in Rajasthan and Telangana concluding at 5 pm today, exit polls for these two states, along with Chhattisgarh, Madhya Pradesh and Mizoram, are expected to be announced by several agencies. Among the agencies which will predict the election results are News24, Chanakya exit poll, India Today exit poll and C-group exit poll. Follow our live blog for all latest updates. The exit polls will be released by several media outlets today. While BJP and Congress have emerged as the two main opponents, regional parties also seem to be having a sway in the states of Telangana and Chhattisgarh. In Chhattisgarh, BSP has joined hands with Ajit Jogi-led Janta Congress Chhattisgarh and will be looking to create a dent in the vote-base of both the traditional parties in the state. Meanwhile, in Telangana, the incumbent TRS under K Chandrashekhar Rao will be looking to coming back to power. In Madhya Pradesh, the BJP will be looking to continue in power after running the government for three successive terms under chief minister Shivraj Singh Chouhan, while in Mizoram the fight is between the MNF and the BJP.